PRINTED ON INSIDE ARMS: "FS417 62 14 714 125 125 Made in Italy FENDI". 100% AUTHENTIC FENDI SUNGLASSES. FENDI Women's Sunglasses FF0041/S Gold 52-20-135 MADE IN ITALY - New! MADE IN ITALY. 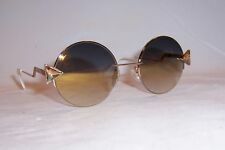 Lens Color: Gold Mirrored. Color Code: 3YGGB. Lens Color:Gray Azure. New Fendi Sunglasses with Case, cleaning cloth, booklet. Style Number: FF 0323/S. Due to light and computer tolerance, g lasses sizes and color may be a little different from the actual item. Providing 100% UV protection from the suns harmful rays these sunglasses are functional in addition to being fashionable. Lens Color : Brown Pink. Lens material: Gradient. Model: Fendi FD Ff0292 Sunglasses. 100% Authentic. What's included. These sunglasses are the ultimate in luxury fashion. Fendi sunglasses feature a fashion-forward and elegant eye glasses collection. Fendi Sunglasses. Fendi Case (Color & Style May Vary). Fendi Cleaning Cloth. You'll love these gorgeous sunglasses! Fendi Sunglasses( Style # FF0193/S). Fendi Sunglasses Case. Fendi Authenticity Card. •Fendi logo at temples. •Brushed gold nose pads. •Gold triangle accents. Lens Color: Gray. Color: Gold. Gold/Gold Grey Shaded Mirror (J5G/FQ). CAN EYE FF 0259/S. Lens material. Color: DDB AP. Size: 55-19-140. Model: FF0194/S. Spikes trim the geometric lenses of these flat-lens Fendi sunglasses. Low profile frames. Hard case and cleaning cloth included. Square frame. Non polarized lenses. Made in Italy. Included: Fendi case, cloth and paperwork may vary from picture. Lens Color: Gold. Lens Technology: Mirrored. Model Number: Can Eye. Lens Color: Gray Azure. New Fendi Sunglasses with Case,cleaning cloth, booklet. Style Number: FF 0323/S. Unused item. It is sunglasses of Fendi FENDI. color Black Gold. Material Plat stick gold Hardware. item sunglasses. 6 Goods that can be used normally. accessories Storage case (with Rubbed Scratch). We are not able to mark the item as 'gifts'. Color Code: 2F7IR. New Fendi Sunglasses with Case, cleaning cloth, booklet. Style Number: FF 0341/S. Lens Color:Gray, Yellow Corners. Black gold/brown shaded pink (2O5/53). CAN EYE FF 0259/S. Lens material. FENDI Women's Sunglasses FF0194/S Gold Copper 55-19-140 MADE IN ITALY - New! New, never used glasses with case. I can send more pics if you'd like. F IS FENDI FF 0323/S. Gold/Grey Brown Shaded (DDB/86). Model Number: F Is Fendi. Included: Fendi case, cloth and paperwork may vary from picture. Lens Technology: Gradient. Lens Color: Grey. CARLINA CHAIN CE114SC. Gold/Light Grey Brown Shaded (722 A). The Fendi 0022/S Sunglasses feature a classic and versatile oval shape. Providing 100% UV protection from the suns harmful rays these sunglasses are functional in addition to being fashionable. The Collection continues the Fendi ideas and philosophy. Fendi sunglasses reveal the heightened haute coutour for which the House of Fendi is known world-wide. ( Case color might vary based on availability.). Model: FF0241/S MVU9K. Colors:Azure /Gray/ Gold. Fendi Sunglasses. Fendi Case. Fendi Cleaning Cloth. Fendi Certificate Of Authenticity. Style: Cat Eye. Eye Size Bridge Size Temple Size. Authenticate Fendi Iridia FF0041/S cat eye sunglasses. Multicolor mirror lenses with crystal and stainless steel material. Used in nice condition. The lenses still perfect, only with few tiny minor scratches. Included: Fendi case, cloth and paperwork may vary from picture. Lens Color: Blue. Lens Technology: Anti-Reflective. Style: Cat-Eye. Model Number: Cut-Eye.